How Does A Permanent Nomad Pack? Never did I think that I would actually write a post about how I pack for my travels. It’s not that I have anything against such posts (in fact, I always read them all with great curiosity! ), I just never felt that my packing style could be of any interest or value to anyone else. It’s really nothing exciting. I normally just take my pile of possessions, stuff them into my trusty Kelty Redwing 2900 backpack that I’ve been using for the past 11 years and be on my merry way. However, while sorting out my current pile of possessions this morning, I had what could only be described as a brilliant revelation, although now that some time has passed, I guess it was really just an interesting thought. Regardless of it’s classification, this idea has set me off on a mission that I have now become obsessed with. My goal is to travel to the Middle East with less stuff, and carrying less weight, than I’ve ever carried before at any time during the past 11 years. Well, typically my backpack weighs about 13 kg (28.5 lbs) when fully packed for a trip, but this time, I’m aiming for no more than 8 kg (17.5 lbs). I’ve even gone back and forth toying with the idea of abandoning my Kelty Redwing backpack altogether and only traveling with my tiny REI Flashpack instead. To travel with only a daypack would be a dream! But at the same time, I’m not so sure I really need to go to that extreme. All I know is that when it comes to packing, the less weight I pack, the easier it is to travel. There’s a huge difference between hopping from bus to bus, from guesthouse to guesthouse and from town to town with 17 lbs on your back as opposed to 50 lbs worth of stuff crammed into a backpack the size of a larger-than-normal hippopotamus, such as the hippopotamus that keeps popping up in my dreams as of late for some strange reason. And so right now I’m about to see if I can make it all happen. It’s going to take some effort but I’m feeling quite confident that I’ll be able to reduce the weight I carry and reach my goal. Well, forty-five minutes have now passed and in the end, after a most painful process of saying goodbye to many items I had previously not planned on saying goodbye to, I managed to end up with this…. Yes! Weighing in at 7.5 kg (16.5 lbs), my Kelty Redwing is the lightest it has ever been and it’s practically half empty! I just wore the packed backpack around the apartment for a few minutes and I barely even noticed it. This is going to be pretty sweet! So there it is. I’m about to embark on a trip that could keep me away from the US for a year or more, and a total of approximately 30 items, weighing a reasonable 16.5 lbs, is all that I need. And even that amount is starting to sound like too much! Perhaps I’ll reduce the weight some more before I leave on Monday. As always, I’m curious to hear your thoughts. Do you think I’m still taking too much? Or perhaps not enough? How do you pack for your trips? I’m planning on going to Nepal in November for several months and travelling light. 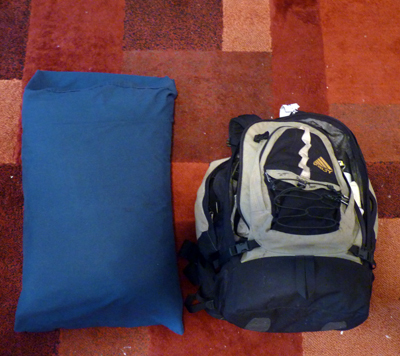 Having done several long trips around India and Central Asia with just about as much as I could carry, most of which wasn’t used on a regular basis, I now will try the minimalist approach. I am probably going to Crete for a few weeks next month, (from my home in Bulgaria), and will just take a day-pack with me, which I can take in the cabin on the flight, so no hanging around baggage carousels ! I’ll be using this as a dry run for November. Another valid point for travelling light is you can buy many items in the place you are going to, usually cheaper, and also helping the local economy. The only thing I would take that you mention that you don’t, is a reasonable first-aid kit. Many times I have used mine to patch up others who have had minor mishaps. One I recall, on the island of Sark, in The Channel Islands, was a young girl who had fallen from her hired bike, onto the nasty gravel. Her family had nothing with them to help her, so I was able to clean her gravel rash and patch her up and reduce her tears. I prefer taking a tablet rather than a lap-top, as it’s so much lighter and I can put in a shoulder bag, (very handy to have), which I use when leaving back-pack in digs. My Canon digital camera is another must take. I took over 1,600 photos on it last trip and it weigh’s very little, even with its charger. Another point you don’t mention, is to take as much in your pockets onto plane , train or boat. It is usually where I put my books, LP guide etc. I also carry my passport, bank-card & medical card in a small pouch around my neck, under my shirt. It’s also handy for cash. Wow your minimalism is highly enviable! I think this may be limiting in terms of where you could go and what you could do with such little gear and clothing options. But you seem to really have something figured out here! I recently went to Chicago, and although nothing compared to the distance you cover and the places you go, I loved being in a new place and seeing everything. I’m also debating on a life of travel like you. I subscribed yesterday and I’ve been reading what you have on this website and I love everything. Super informative and so enlightening. I never really imagined that one could get by traveling around the world – truly, a nomad. Please continue writing and sharing with us! I will for sure be reading more of your work. I’ve done a little bit of traveling (nothing or at least to me not enough, but to my friends they call me the World Traveler). I always have my packing list near by. Very excited to see what you pack. I use a backpack myself & always trying to lighten up. Thanks for sharing. I “daydream” daily about traveling. Headed to Peru for a medical mission trip this July. Looking sooo forward to it. Nice packing job. I always find that the lighter I go the more I enjoy it. It makes moving around so much easier. If you are doing a carry on, how do you get that large of a size of contact solution onboard when the limit is much smaller? Hey Tom – In many countries, contact solution can be taken on as it is considered ‘medication’. I’ve never had a problem bringing it on a plane. I’m in my moving to Cambodia permanently (from South Africa), so I’ll be an expat. What do you suggest for travel/medical insurance. My question is, if I purchase annual ongoing travel insurance say, from World Nomads, would I have to pay out of pocket for a hospital visit and claim later? If so, is it possible to receive the payout in Cambodia or do they only payout when you return to your own country. Obviously in my case I won’t be returning, maybe only after 2 years for a visit. Your advice or anyone else on here would be appreciated. Hi…. in my opinion, When you are in Cambodia, if you ever need the hospital for something important…. you should try to get to a good hospital in Thailand. Most of the doctors Thailand have been trained in the U.S., Canada, or Europe, Australia…and the quality of of doctors and hospitals is higher than in Cambodia.. I can’t speak for everyone… but I’ve had good experiences with Thai hospitals..
Hi Earl! I was recently on a trip to Madagascar with a group of friends and I ended up taking a 70 litre pack that weighed about 14kg! Although, I will admit that once I was in country, I only needed half of the stuff I took with me. I was wondering, that if you were to travel for longer and eventually settle down, when you do, how will you have enough money for a house/retirement/etc… I LOVE your blog and it inspires me to also become a nomadic explorer but I just keep thinking about the money and what I would do if I decided to stop and settle down? Hii Earl, Do you plan to settle sometime(ever planned to get married) or will be forever lone traveler. just a random question. It has come time for me to get a new travelling bag (RIP my old eurohike one!) but am thinking of going lighter as mine was 65 liters. I see you recommend 50 liters for a year’s travelling, I’m going for 5 months so am thinking to go with this. But I have a question about when travelling with your laptop, if you want to take it out with you to a cafe or something similar do you just take the Kelty out with you and leave your clothes etc at the hostel/guesthouse. Or do you have your day pack fit into your Kelty and then take that out with you when required. Hey Mayur – I carry a separate daypack with me that fits into my Kelty and I use the daypack whenever I go out, for the day. what kind of hiking/athletic shoes have been the best for you? Great post! I pack a similar amount on my travels – in the past when traveling for business, I’ve done 6-8 weeks out of a “boarding bag” (half the size of a standard carryon). Now that I’m living the digital nomad lifestyle, I’ve got a Gregory Z40 – and I pack a similar amount of clothes and electronics. What about a sleeping bag and backpackers tent? Hey Michael – I’ve never traveled with a sleeping bag or a backpackers tent and never really needed either at any time. Dont you need to iron your clothes after washing them? Hey Bill – That can be done by any local laundry place very cheaply or I just splash some eater on my clothes, smooth them out and let them dry, that works too. Ok so why only 2 contacts? Where do you replace them while you are gone. Mine are 30 day and was thinking about just glasses but they are a pain. Also why that type of incense and for what? Hey Priscilla – Two boxes of contact lenses is enough for a year for me and then, whenever I’m back in the US, and I’m running low, I just order more. Likewise, if I need more while in another country, it’s quite easy to get them pretty much anywhere. And the incense is just my personal favorite incense and I use it in my hotel/guesthouse rooms as, to me, it helps create a nice atmosphere. But here is my actual question: What daypack do you have? You have your Redwing 50 and leave it at your accommodation, so what pack do you use for going into town, museum, walk to the beach or whatever? Ok, because I was wondering if I would travel through India where would I do my daily laundry? But I guess it is probably possible to find a shower or sink just about anywhere. Also, another question that really bugs me is: what do you do when you get sick? I am so scared of getting sick and being somewhere in the middle of nowhere in India or another 3rd world country and not being able to get the medical attention I need. Hey Mary Jo – If you get sick, you’ll go to a hospital or doctor and get treated, just like anywhere else. For most things you might get, there are easy treatments and you can find the medical care and medication you need just about anywhere. I do think what you do is fascinating, but how do you get by with so little clothes? I am sure you get very dirty (sweaty) every day (especially in a hot country), but you can not change your clothes every day. Especially underwear needs to be fresh everyday. How does this work? I could not live without a bathroom and fresh clothes everyday, but I do wish I could travel all the time! Hey Mary Jo – I travel with several shirts and several underwear and it is always possible to do laundry somewhere. And if I’m stuck, I just wash some in the shower or in the sink and in a hot climate, they’ll typically be dry by morning. I consider myself a Nomad wannabe. I’ve gone on 1-2 year trips, come back for 6 months or a year than go out again. The one thing I have found out is that whatever you think you need, cut it in half and that is what you will actually use. You only think you will need to wear something different everyday. I found myself actually wearing the same thing 2-3 times a week. No one cares or knows the difference when you are away. My first stint away I carried a 32 inch roller case. My 2nd time a 22inch carry on that weighed about 30 lbs. My latest adventures I traveled for 2 years with under backpack that also converted into a roller that came in under 16lbs (it included my mini laptop)…and I’m a city girl! Not to mention, if something comes up, you can always purchase a skirt or pants or whatever oversees. You may even find a one of a kind item. Is a 40L enough for a trip around SEA? It should be right? Or is it more than enough? Hey Adel – It depends on the person as everyone has a different ‘comfort level’ when it comes to packing. I have friends who have been on the road for over a year and carry only 30L pack with them and others who need an 80L pack! Whatever you feel comfortable with, that’s what you should take. Hi, how big is your backpack? Hey Adel – I now have a 50 liter Kelty Redwing 50. So you bring that packed bagpack, a daypack and you’re off for a few months? That’s really amazing..
And do you leave your bagpack at the place you’re staying before you go around exploring? Or do you carry it around since it’s pretty light? And, do you ever have to sleep in the open/do you always have a place ready? Hey Phoebe – There’s no stupid questions! I never sleep out in the open as there are almost always places to stay, whether it be a hostel, guesthouse, budget hotel or even a couch from couchsurfing.org. As for my back, I just leave it in my room every day while I’m outside. All I carry with me is my daypack with my camera and anything else I might need inside and that’s about it. Excellent blog. There’s a few things I consider essential that aren’t on your list. I’m curious if you don’t use them or if they’re acquired as needed. – Sun hat for less heat and less skin cancer. Larger head than most means I have to bring, not buy. – Flashlight. I use mine almost every trip to find something small I’ve dropped on the floor in a dimly lit room. – Plastic plate, bowl & utensils. Private rooms and cheap hotels don’t have them. – Tiny plastic screw top container with enough detergent for one wash.
– Poncho (in season). Every poncho I’ve bought in tourist areas was so flimsy it lasted about 2 – 3 uses. If I don’t have one, I could get drenched looking for one. – Laundry. Some sinks are tiny so I carry a Sea to Summit 20 liter lightweight dry sack. Can wash 4 items at the same time inside it. Weighs 4 oz. Also holds all my electronics if I must go outside in a downpour. @Four Letter Nerd: I don’t bring a hat with me but my afro tends to keep the sun out of my eyes 🙂 I have a flashlight app on my phone that works better than any flashlight I’ve tried. As for utensils/plates, I’ve never needed them as I simply use whatever I can find. With detergent, I buy it by the single use packet when I’m traveling so that I don’t have to carry it around with me. Never had a luggage tag and never traveled with a poncho either. And if the sink is tiny, I normally will wash clothes in the shower. how do you handle it with your contact lenses? Do you wear them everyday and can you buy new ones in foreign countries easily? Hey Verena – I do wear my contact lenses every day and I normally just stock up on one year’s worth of lenses every time I’m back home. However, there have been a couple of times that I needed to buy them overseas and it’s quite easy to do in most countries. Just head to a major city, find an optician and they’ll get you what you need, usually for decent prices. I’ve never had a problem traveling with a few boxes of contacts for long periods of time though. As for contact solution, in India, it’s actually quite cheap and you can buy it at most pharmacies, and it’s the same stuff you buy back home as well. Hope that helps! Do you use travel-specific clothes? You know, those made of special fabrics that dry super fast and don’t wrinkle much (so that one can wash it before going to bed and it’s dry in the morning). Most books and recommend these and I was curious if it’s something you vouch for or if it isn’t all that relevant to you. Hey Luisa – I don’t really use such clothes. I just stick with the same normal clothes I would wear when I’m not traveling and that has seemed to work out just fine for me over the past 13 years! Did you ever felt the need to take a first aid kit with you? How about health/travel insurance, do you have any or since you’re on the road permanently you just don’t feel the “need” for it? Thanks Earl, that was very helpful indeed 🙂 It’s always amazing how you manage to always write the most useful posts! Your blog is a must for anyone thinking of long-term travel! How do you get by with so few socks and boxers? You must do laundry quiet frequently? Hey TJ – I do laundry about once per week I guess. Rarely do I wear socks as I’m wearing sandals almost the time and if need by, I can quickly wash a pair of boxers in the sink and they’ll be dry by morning! I love your site. I know this is an old post but just wanted to say to the girls commenting that you can pack really light too! Last trip I went on was for 6 weeks in SE Asia and my bag weighed 5kg. It was awesome. 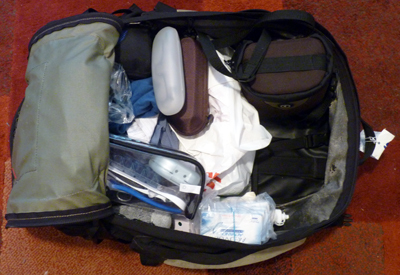 That was including toiletries, camera a large medicine kit with all my malaria tablets and antibiotics etc. Also Earl, I was wondering if you have lived in different places within the US? I’m an Aussie and want to live there for a year next year (then maybe check out South America or whatever). I read that you dislike cold places (so do I) so I was wondering if you have any recs for where would be a good city to live in which is really warm and a good vibe? Only a few months left until I sell all my furniture and belongings and get on a plane! Keep up the good work. Hey Phoebe – Haha…well, hopefully soon you will be on your way…do let me know where you end up going! I’m from the Pacific Norwest (Idaho, Oregon and Washington) If you love the outdoors, this is heaven. Everything from white water rafting to the bat caves. This area is lush and green. Come visit between May and October if you don’t like our wet, cool winters! Yep, once you drop down the baggage weight you wonder why you ever thought you needed all that “stuff” before. I too carry a similar amount of clothes (though 3 knickers 2 bras) and minimal toiletries and just buy what I need on the road. I’ve been wearing continuous wear contact lenses for the last 5 years, meaning not having to pack cleaning solution and no hygiene issues around removing them daily. Bit more expensive but so worth it for travelling. This is one thing that always stumps me when thinking about my future! I’m planning to have a life similar to yours once I graduate, however my second love (only to traveling) is fashion. I have a closet three times the size of most of my friends. I can’t imagine giving up most of my clothes, yet I realize that the amount I have is nowhere near practical for the life I want to lead. In the end I know travel will win, but it’s a little depressing to think about. All my girl friends will be thrilled however. haha. congrats on getting the weight down so much! First visit today… Will spend more time looking it over later. Thanksgiving and traveling south to San Diego. I am curious on what you use for software and for doing your website. Yes! Even mature women can travel light. I’m the kind who always took a full sized suitcase on a weekend trip. Until I traveled with my daughter — abroad for the first time in my life. I had surgery 2 months before our trip and my daughter allowed me 16 lbs in my backpack (which also had wheels — and helped me a lot). We had a great time – covered an unbelievable amount of Europe in a short time, used everything in that back pack over and over – but lacked for nothing!! I want to see much more of the world. It was an eye popping experience. Favorite places Barcelona and the Swiss Alps. 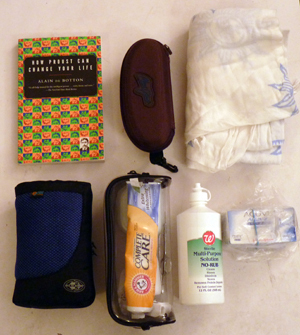 Hey Kiki – Thank you for sharing your tale and 16 lbs certainly is considered traveling light! And I think that if you can manage to travel that way one time, it suddenly becomes addicting when you realize that you really don’t need much stuff at all to survive while out there in the world. It will certainly make it easier to continue traveling and exploring this planet of ours! Do you bring a water bottle? How do you stay hydrated, especially in such warm places! Hey Liz – Normally I will buy one large bottle of water when I arrive somewhere and then just fill this up whenever I need to. Sometimes I can’t find free drinking water and so I need to buy another bottle but I’ve never really found myself in a situation where I had no access to drinking water. It’s much more available around the world than one might imagine! This post is extremely inspiring. I went to Europe this summer in a very minimalist fashion like you travel. It was extremely liberating not living off so many material things. This lifestyle has carried into my everyday outlook and has really streamlined and focused my life. Keep up the awesome work and never stop wandering!!! Thanks for that Austin! I’ve also found the minimalist style to be quite addicting and as a result, it has spread to all aspects of my life for the most part as well. One of the most important lessons I’ve learned from traveling lightly is that I would rather have experiences than possessions and that’s something that I don’t think will ever change. Seems like you probably feel the same way after your European adventure this year! PS: good post and some great back and forth in th comments section. To each his own. My motto has always been “If you can’t carry it on, or through, or over, under, between or around, and are so worried about it that you can’t leave it anywhere, than you can’t take it”. Too much …and not enough. In the Redwing 2650 …I drop the shoes, thus dropping the socks too, opting to go full on flip-flops – even did Nepal in em’. Never had a problem and I could always buy a pair for about 1/10th the price there …if I really need em’. I never carry a computer – interent cafe’s are fairly easy to find (or hotel/hostel computers) but always carry an SLR …so it’s a wash there. Drop the towel, use one of your t-shirts. I actually switched back from contacts to glasses a few years ago and like the fact of no solution/no extra contacts, etc …plus lighter and can be somewhat smaller. In the end, it’s all opinion, and everyone is different, so for you, your list is probably perfect, or as perfect as can be, as mine is for me!!! Hey John – That’s the thing, everyone has their own list of important items and list of stuff they don’t really care to take with them. I need my laptop as I work online every day and because of my flat feet, I need the shoes because I put in custom insoles so that my knees don’t start hurting! Well I have to say you’ve packed waaay less than i could manage on my last few trips. (makes a diff that i’m a woman i guess? 🙂 ). After my last trip to Syria where i didn’t realise i was missing a pair of pants from my luggage until after i got back! I’ve been trying to pack less and travel light. As for the incense, I’ve always felt that one stick of incense can help turn even the worst budget hotel room into something that is somewhat bearable. It’s amazing how much better I feel after lighting incense when I find myself in a room that is not the nicest! I’ve been traveling with contact lenses for 11+ years and have yet to have a problem at all. And I know plenty of other travelers who use contacts as well while on the road. It’s much easier than you might imagine! Hey Sanny – Thank you for commenting! With contact lenses, I normally purchase a 1 or 2 year supply every time I’m back home in the US. However, the only reason I do this is because buying contacts online in the US is much cheaper than anywhere else I’ve come across. But it’s actually quite possible to buy contacts in most countries and I’ve had to buy them in Thailand, Malaysia, Eastern Europe and even India when I either lost my supply or stayed away from the US for longer than I had expected. I’ve also had eye exams in many of these countries as well (I just had one here in Mexico actually) so it’s quite easy to get a prescription. Of course, many countries don’t require a prescription to buy contacts at all! And in terms of hygiene, I’ve never had any issues with any of the contacts I’ve purchased overseas. They are the exact same brands and prescriptions that I normally buy in the US. I’m not from the US (I’m English), but that’s really good to know. Although I did read in one of your recent-ish posts that you had conjunctivitis. So maybe I should consider laser eye surgery…or the dreaded glasses. I’ve just discovered your blog and am devouring the back catalogue. My most impressive achievement was three months in Europe, USA and South America – different climates and different types of travel. I left home with 7kgs and carried on for most of the trip (which could be a large part of why I always got pulled up in US airports for extra screening). My small collection of 100ml bottles were always ready to present to security in my handbag. On a round the world ticket I knew I’d be spending a lot of time in airports, so it was such a relief to be able to walk straight off the plane and get going. Having such a small bag also helped in that I couldn’t do a lot of shopping (which was good on a budget) but of course I picked up a few things along the way. I ended up with 10kgs checked on the way home. Of course, that doesn’t beat the time I went to Cambodia for 2 weeks with just a small daypack (my boyfriend at the time took a toothbrush and his passport, that was it!). Travelling light is the only way to go!! Hey Carly – That is incredibly impressive! 7 kg for 3 months would be considered impossible by most but the best part is that once you pull it off and realize the benefits, you’ll most likely never go back to a heavier pack again. As for the toothbrush and a passport method of travel, that’s just plain crazy and awesome at the same time. Maybe one day I’ll give that a try 🙂 Although the daypack method seems a bit more reasonable. What do you use for doing your laundry? Do you bring along a clothesline to dry it on? Do you use detergent? If yes, do you bring your own? Any other hand laundry tips and clothes drying tips you can give to someone that’s never done it before? Hey Michael – If I need to, I’ll just purchase a small packet of detergent in whatever country I happen to be in. In many parts of the world, especially in the developing world, you can buy tiny packets that are good for 2 or 3 washes. And then I just fill up a bucket (some hotels provide them) or just use the sink. As for drying, it depends, if the hotel has a roof, sometimes I’ll hang my clothes up there, if not, I’ll just hang them around my room. However, many countries also offer very cheap laundry services from tiny laundry shops scattered all over the place. As an example, here in Mexico, it only costs 66 US cents per kilogram to have your clothes washed and dried in less than 24 hours. So if I have the choice, I’ll always send my clothes to the laundry place as it basically costs the same and frees up extra time for me! @Globetrottergirls – That’s a good business idea…packing other people’s packs! I like it. Hey Dina – I did find my Blackberry, but for some strange reason, it doesn’t work at all over here. Oh well. A banana box? I’ll be honest, I don’t even know what that is! Please do explain 🙂 Is it a case for a banana? D’oh! That’s too bad! So what will you do about the Blackberry? Get a new one? 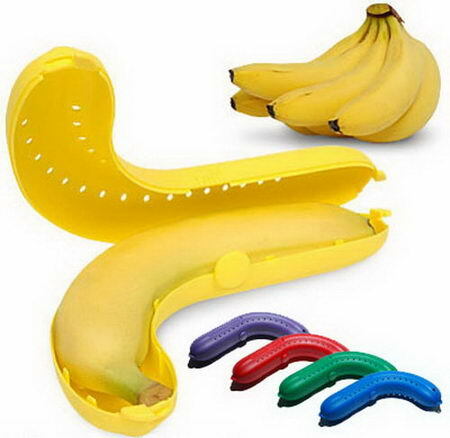 Nope, I have yet to see the banana case before and I can’t really imagine that being a useful travel gadget! If I want a banana, I just buy it and eat the banana and rarely need to protect it for an extended period of time. Am I missing something?? I think you’ve done a fantastic job! If you want to pair it down more, I’d take spandex or easy to dry light-weight fabrics– I’m a girl so I can do leggings. No thick fabrics. cotton t-shirts are heavy & take a while to dry. Also you can buy & throw away clothes in the countries you visit. It’s the equipment which is prob making your mind think you’ve a lot of stuff & unfortunately, the gadgetry, you can’t really cut down on. @grrltraveller – It’s true, if there’s one thing it’s impossible to get rid of, it’s any of our gadgets or their accessories. And actually, now that a week has almost passed, I’m quite happy with what I’ve brought. I’ve already dumped a few things and have reached an ideal weight. Next time I’ll look into some light-weight clothes as well. I travel full-time, and the biggest challenge is dealing with trips that combine hot and cold-weather places. Layers and leggings are the answer. I run frequently, but also hike, so I have two pair of shoes, which I’d like to whittle down, but it’s uncomfortable to run in hiking shoes. Well done Earl, that’s good going! We are carry-on only too and our bags weigh about 10kg. Although this is far less than everyone else we meet on our travels, I would still like to go lighter. The problem is needing warm clothes for South America and books! I can’t get by with just one as I can get through it in a day and I get panicky when I can’t find another good book! We are definitely getting a Kindle as soon as we have an address for long enough to have it delivered. Let us know how this packing list works out for you! Very Impressive Earl, I just wrote virtually the same article but with my stuff, and I have twice as much weight wise pretty much (and twice as many words in the article!). I’ve only got a year + half use out of my backpack so am reluctant to get rid and get a smaller bag, I think that’s the first step towards minimalising things. I figured the next step for me would be 2 daysack style size bags, one for clothing, one for electronics as I like to carry my electronics around with me when I travel. Hey Rob – You wrote an excellent post about what you travel with, definitely more in depth than what I put together here. There is definitely plenty more that I could have taken that would make my life easier (umbrella, rain jacket, etc) but in the end, I dislike carrying around a heavy pack so much that I’d rather get soaked in the rain than carry those items! And I do back up everything on line which is why I don’t have the external drive. I went with Mozy.com and so far I’ve been more than satisfied. Through them I’ve backed up everything online and as a second backup, on another computer that I always leave in the US as well. Seems worth the $5/month to me! have a most amazing journey! As a traveller about to start on a journey of my own – this is a very helpful post and a reminder to not overpack from the start. I’ll be okay with a bit more than you have, mainly as I’m going to start in New Zealand for at least a month and will likely pick up an old used car along the way. That being said – I want the freedom to continue the journey to other parts of the world without needing a porter! My biggest challenge is going to be camera equipment. I’m an avid photographer and will have to fight my urge to carry every lens I own! Great site – a big help as I start to plan my trip. Looking forward to hearing more about your trip. When are you starting your trip? My current plan is to start in NZ in November, and figure it out from there! Part of my issue is I’m not sure yet if I’ll spend multiple months in NZ (current thinking) versus starting to bounce around the world. The camera equipment (and laptop) will be my biggest challenge. Camera gear alone will run me 10-12 pounds, and that’s being pretty limited on what I take. 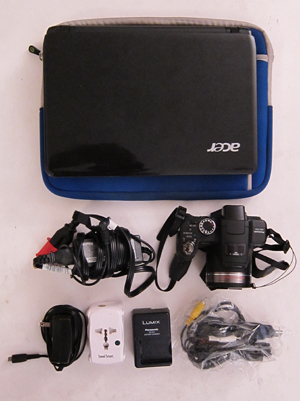 Add in a laptop, charger and a few external hard drives for backup, and there is another 5 pounds. Clothes & Other 10 lbs. Puts me at 40 lbs – which is at the top end of what I’d really like to carry too far. It is fine for NZ, if I have a car and can leave stuff behind when I’m hiking. But if I’m heading elsewhere, It is probably too much. 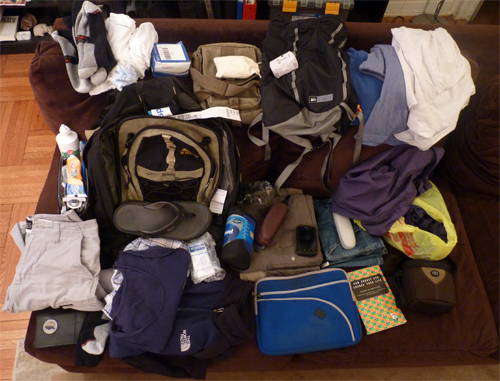 Though I suppose if I head out of NZ, I can get rid of the camping gear and drop most of those 10 lbs…. Hey Steve – That was the first thought that popped into my mind as well, about selling off all of the camping equipment at the end of your stay in NZ. Also, by that point, you’ll have a much better idea which of your possessions you actually need and which ones you could do without, so there’s a good chance you’ll be able to knock 15 lbs off…and that would leave you with a very manageable 25 lbs for the rest of your travels! Earl, you are my travelling hero. I’m impressed with your packing! I’m really minimalist, so sometimes, I see extra stuff that I’d probably do without. I traveled a lot through Africa with just one backpack and it’s true that you can really find anything you need… I’ve also found you can make your clothes last longer in drier desert climates. Good luck and looking forward to hearing about the Middle East! Hey Mary – After starting my travels with two backpacks (one on the back, one on the front setup), there’s no way I could go back to that now! And for some reason we tend to forget that in most places in the world, we can find everything we could possibly need. Even in the most remote places it is quite easy to find whatever we may be missing…another reason to pack less from the start! How do you cope with only one book, though? Do you just exchange as you go? Hey Theodora – I do just exchange books as I go so keeping only 1 book on me has worked quite well so far. And I don’t normally carry any medicines…as I’ve never been anywhere where I can’t find pretty much anything I’ve ever needed. Of course, I’ve luckily never really needed much so I could see how a few important medicines might come in useful. Thank you for the comment as always! Hey Earl, I live in Egypt so not traveling but am really looking at pushing my items down to nothing for day to day living. Living like a traveller at home will help packing up and leaving to the next country much much easier! Hand washing is pretty damn easy esp only if you have a few items. I met a thai lady who was travelling here with 2 days of clothes, an umbrella and a camera…. That really was about it (apart from toiletries). Hey Forest – That’s an interesting idea…to live like a traveler at home. Many people might think that having a home means you are free to load it up with more stuff to keep you comfortable but I personally feel that your idea is much better. Being able to just pick up and take off to the next place without needing days or weeks to pack up is a kind of freedom that is difficult to resist. And yes, hand washing is quite easy…I never really understand why some people make a big deal of it. It’s almost meditative to me! Extremely impressive, Earl! You packed neatly and pretty damn well. Looks like you’re all set…. you must be so excited 🙂 But to be away for a year? Whew. Hope everything goes great for you. And just like you said, no matter where a person is in the world, they can always find whatever they need. It’s not as if the rest of the world doesn’t sell clothes! I think what you are taking is enough. I would love to cut back even more on what I pack, but it usually comes down to how often I will be able to do laundry. I usually pack 5 days worth of clothes. Thanks for the peek inside your bag! Well. I for one am jealous and incredibly impressed. I wish that I could travel with less items… It makes travel sooo much easier! I could make that choice to, I’m sure, but I’m not. I want my skateboard, my SLR camera + lenses (I sell stock photos online), my laptop (to run my location independent business), and then my clothes and other necessary items. I’m going to try to fit it all in a 60 liter backpack. We’ll see. Hey Jenny – Everyone needs different things to be happy while on the road, so if you want to take the skateboard and other equipment, then you absolutely should of course. A 60 liter backpack wouldn’t be terrible at all with all of that equipment. I’m sure you can make it happen! Wow, Earl. 7.5 kg of stuff is very little. I’m impressed. I have noticed on my travels that I started to pack less and less. I now have a 55 liter backpack, which usually remains half empty. One draw back of only travelling with a carry on would be that customs and immigration might get suspicious. Are you still taking a small day pack? Only 2 pairs of boxers?! Wow. I don’t think I’d ever be brave enough to pack so few under garments. 😉 Your packing is quite impressive. More power to you on making your pack under 17 lbs! Hey Andi – It might be harder to pack as a girl in the beginning but I bet that if you narrowed it down to only a handful of items, you wouldn’t miss too much in the end! My wife and I are not so minimalist with our travel needs. We have workout clothes, a guitar, several books, even a time machine for backups but we still don’t really have proper clothes for the colder weather. We are trying to cut down a little but there is no way it is going to be only carry on for a while. Hey John – Everyone definitely has different needs and it’s all about finding a balance. I’m hoping my clothes will be sufficient but there’s a chance I might need to pick up some more if the weather gets too cold. And I’d love to carry a guitar with me if I knew how to play one! Hey Natalie – Haha! The sarong is one thing I always take with me, but I usually wear it only when I’m in my hotel room if I’m not in a sarong-friendly location. Oh nooooo, this makes me think the bag I bought is definitely way too big. My excuse in my head (as someone who is planning her first trip back packing) is that I am a girl, I want to have variety and I want to be prepared for several climates. But I don’t think that argument will fly here! Also us girls carry way too many toiletries. Only thing I am not worried about is the high tech gear. Apart from an ipod, I’ll have nothing electronic of any significant size/weight. Hey Sarah – You can still carry around a bigger pack and leave a good portion of it empty! As an avid reader, I’m a fan of the Kindle as you can carry a lot of books with the same weight and size of one book. Plus, you know how difficult it is to get a non-beach-reading book when on the road. Either way, I think you’ll definitely like your lightened load. I don’t think you’re going back! Hey Kyle – I debated about buying a Kindle during my stay in the US this time. In the end I didn’t because apart from carrying too much weight, my next issue is traveling with too much gear that I then worry about losing or having stolen. But knowing myself, I’m sure it’s only a matter of time before I switch over! And good books are always hard to find on the road…although Chiang Mai has perhaps the best selection of English-language Used Book Stores that I’ve found anywhere! Earl, congrats on shrinking your travel gear. Currently I have my entire life in about a suitcase an a half. I have been trying reduce this for a while now. Your post has reminded me to get back to work on that. Thanks mate. Have fun on your trip. Hey Ozzy – I love the idea of having your entire life in a suitcase and half. Apart from my backpack, the other half of my life is in 2 boxes in a closet. 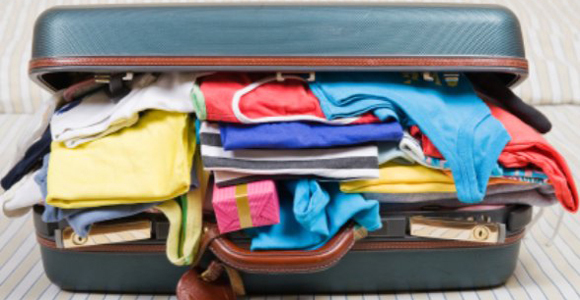 There’s always a way to reduce what we have even more, so I’m sure you can find a few things to remove so that you only have 1 suitcase of stuff before long! This is so inspiring to me. Once I’m done with my upcoming trip and start focusing on international travel I would love to go for a long time with just a day pack. There’s just something about knowing everything you need is on your back. Hey Nate – That feeling of being able to move around without the hindrance of a large suitcase or backpack is quite exhilarating. And not only does it make travel easier but it’s a great lesson in materialism and need. I’m quite sure that almost anyone about to take a trip could fit everything they would actually require into one tiny daypack. What will you be taking on your epic walk? What I’m bringing on the walk is actually very similar to what you are, except add sleeping bag, stove for cooking, tent and food. That stuff adds quite a bit of weight and takes up a lot of space! Hey Nate – That stuff will definitely add some weight, but you could always pull a small wagon! On a side note, I’m really looking forward to reading about your journey…I’m impressed already and you’ve yet to even begin. I’ve always toyed with the idea of walking around the world so I’m sure I’ll learn quite a bit from your adventure. I really appreciate the kind words! And if this walk goes well continuing it as a round the world walk is a very legitimate option that I’ve thought about. I’d already be about 1/4 of the way done. Thanks again, Earl. Cheers! Looks like a pretty well edited kit, but don’t you travel anywhere it rains and/or drops below 40F!? No jacket? I had to ditch almost every bit of cotton clothing I had… It’s a nice feeling to know, at all times, that I can jump (aka fall) in a river and be dry within a few minutes. The electronics and miscellaneous cords remain my achilles heel. Hey Andrew – Actually, I don’t travel anywhere where the temps drop below 50F! I can barely even survive when it’s 60F outside and as a result, prefer to remain in warmer climates as much as possible. So my North Face fleece should be sufficient. But I’d be curious to hear about your non-cotton clothing…any particular brand recommendation in particular? Well… I’m writing this in my skivvies (Under Armour, good stuff except for the massive logos) because I had to take off my pants to look at the tag to answer your question. They’re a lightweight, simple 100% nylon job by The North Face. I’ve worn them from about 0F to 110F, and just add another base layer when the temp drops. Despite the light fabric, they’ve proven nearly indestructible in thorns, scree slopes, et cetera. I don’t go anywhere without them (for the last 3 years). The only kryptonite I’ve found for them so far is… fire… Oops! I’m thinking about springing for a pair of these because the polyamide material is supposed to be pretty durable AND they have a waterproof internal pocket that might protect my phone/ipod when I happen to be submerged. The Craghoppers brand that makes them has some other interesting pants and shirts, but I don’t own any of their stuff yet. For shirts, I’ve found that almost anything marketed as having super-ultra-wicking-magic-bla-bla-bla tends to dry pretty fast and wear comfortably. I just check the label for absence of cotton and a blurb about wicking and go from there. The outdoor team sport stuff (football/American football) is the best place to find discounted gear that fits these requirements, but the hiking/outdoor stuff tends to look more unobtrusive, thus more travel friendly. But since I’m usually either biking, kayaking, sailing, or hiking… fit/performance is more important to me than looks. I can only imagine the thoughts of other people around when I’m shopping… looking at the dude holding something and feeling the fabric with closed eyes… imagining what it will feel like soaking wet. There are some funky technical wool blends that are cool too. If you can find them in a nice lightweight fabric they can be nice because they hold less odor than the synthetic stuff. That said, whenever I’ve been in the tropics, everything organic gets attacked by mold… so the synthetic stuff can’t be counted out. Hey Andrew – I certainly appreciate you removing your pants, the resulting image of which proved to be the first of many interesting ones that entered my mind while reading your reply. Not only was that information you provided useful, but highly entertaining as well. There seems to be some good stuff out there, although I’ve always hesitated to buy ‘travel clothes’ thinking that in 11 years of traveling, I can’t remember a single time when I wished I had them on. But I suppose a pair of strong yet light nylon pants wouldn’t hurt or even better, pants with waterproof internal pockets (that does sound quite appealing). I try my hardest to buy all the quick dry stuff I can. REI, Columbia, etc. It seems to be tougher than DEATH CLOTH aka cotton. However, there is nothing like a well worn T-shirt. As for the electronics, I try to find stuff like the Olympus Tough but I’m still waiting on a DSLR like that. I love packlist posts! I always find time to read them because when I travel somewhere I always wonder what people bring along with them. I think you’ve about hit the nail on the head with your list. I’ve been experimenting with my 40L backpack and my pack list and I know that I’ve been able to cut down from my original packlist that I posted on my blog. My backpack was weighing in around 20lbs but I think i can get it down a few more pounds with no problems. Can’t wait to read your posts from the middle east! Exciting! Oh, another thing; I’m curious to know what you did with the stuff that you said goodbye to? The extra clothes are in a bag to be donated and most of the other items are going to my friends who I am currently staying with. We’ll consider it my rent for the past 2 weeks! I find this terribly exciting, Earl! (And I know that tells you just how much of a geek I am, but for this I make no apology!) What I’ll be taking on my upcoming Middle East trip is very similar in weight and composition to you, though my trip will only be for 3 months. However, I don’t really think the length of a trip like this makes much (if any) difference to how much stuff you do/don’t need when it’s for longer than, say, a week (i.e. a 2 week and a 2 month trip need pretty much the same amount of stuff). As for packing carry-on only, the only disadvantage that I find is that I won’t be able to take a pen knife or similar; otherwise, it’s the best way to go, surely! I don’t think I could possibly say that you’re taking too much stuff, and if you’ve got what you’re going to use, then I don’t think anyone could say you haven’t got enough. Congratulations on your down-size, and thanks for sharing! Looking forward to hopefully crossing paths in the Middle East! Surprisingly, you make a point when saying that you rather check-in your carry-on to take time to adjust. I often felt that if I could take my bag with me aboard the plane, it’s that much safer and guaranteed not to arrive 5000 miles away from where I will be landing. Shoot, Earl does this approach lead to more time spent doing laundry or actually less time? Hey Jeremy – It might lead to some extra laundry but I don’t mind spending 20 minutes each evening washing a couple of items of clothes. Especially if it helps keep my backpack so light! Maybe I’m missing something, but no shirts? This is really impressive. I’m shooting for carry-on only for an upcoming trip in October. With all the paperwork I have to carry, it’ll be tough, but seeing how you pack is inspiring.